This month I was a guest on episode #8 of the opposable thumbs podcast. The podcast is hosted by Rob Ray and Taylor Hokanson and on each episode, the hosts and a guest tackle a creative challenge and then discuss the results, discoveries, problems, and solutions. I was very excited about it when I listened to the first episode so a made a gift and sent it their way last April. This was my first podcast and it was a really nice experience. Rob and Taylor were super welcoming and very organized. They had an agenda and documents about what to expect as a guest, which was very helpful. And while recording the podcast we were able to exchange notes and pictures using slack. I wanted to post a couple of pictures of the thing I made here but you should go listen to the episode and look at the other projects on the opposable thumbs website. Part of my inspiration was XKCD comic number 936 on Password Security. My intention was to make a sort of analog password generator that looked good and was nice to handle. 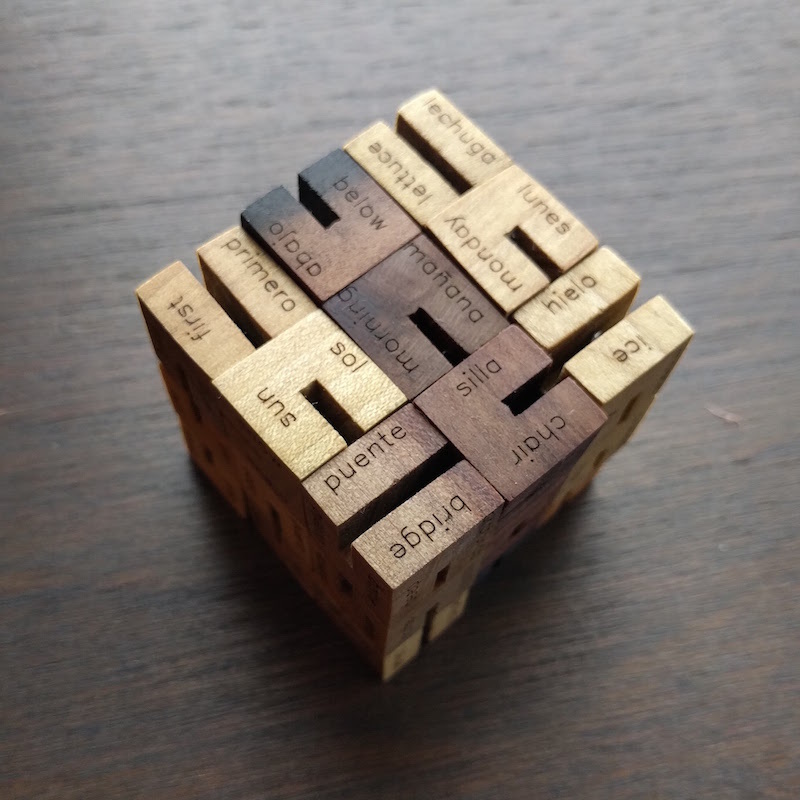 So I made a “flexi-cube” (I’m not sure if this is the technical name). This video tutorial by pocket83 was very helpful, I mostly used it for inspiration but it really covers the basics if you want to make your own. After cutting the cubes I engraved the words using the laser on my converted 3D printer (an old solidoodle-2 with a 30 dollar 1/2 a watt purple laser that I modified following this instructable). After engraving the cubes I assembled them using elastic hair bands. I made 3 different versions: the first one has only English words, the second one is bilingual (English and Spanish) and the third one has Japanese words written in Hiragana with their corresponding translation. I finished the poplar with olive oil to bring out the color. This is, of course, a proof of concept, but the basic idea is that you would be able to generate simple 3 or 4-word memorable passwords by playing with it. There are a lot of possible combinations. 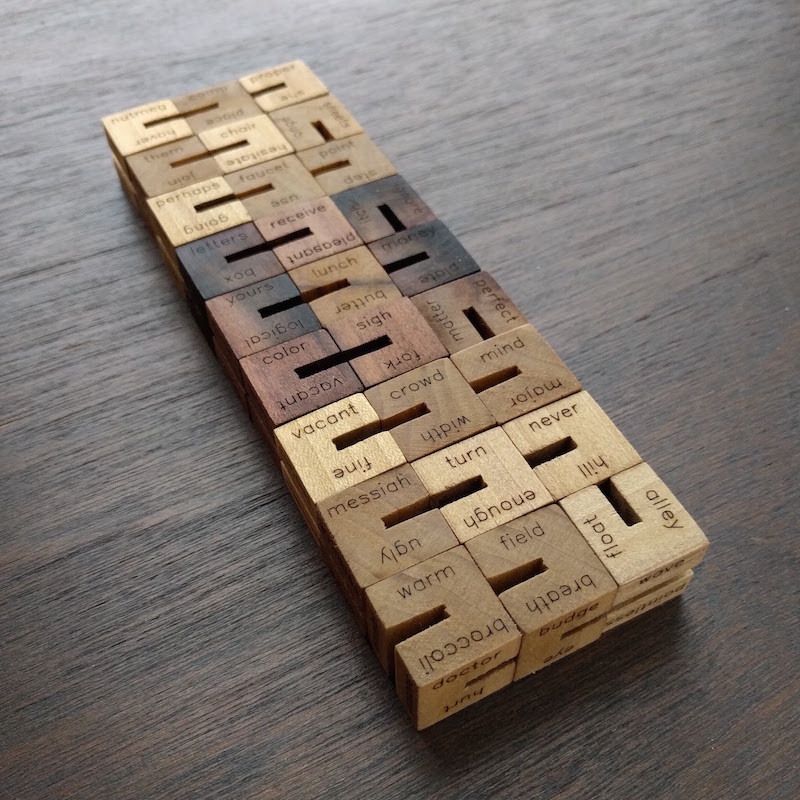 Each version has 27 cubes with 2 words per face. That is a total of 324 words in the English language one and 162 words on the bilingual ones. It’s also just a fun toy. On the subject of passwords, don’t take my word for it, there is more to it and there are more sophisticated ways to generate them, do you research.